I run out of ideas quickly, or my ideas don't work then I get discouraged. Indeed. I have no clue how to be creative in this game. I find playing mountainous or hilly maps prevents me from creating grids. It's way more fun too. We should share our cities. Here is my latest one after I finally recovered from a tsunami that took out nearly a third of my city. I added oil power plants because my dam was overwhelmed. They're shut off and only used in an emergency. I also turned a meteorite crater into a flood pond. There's a cable car going up to the same area as the winding road where there's some tourist sites. I agree that it's fun to have to deal with terrain to make more interesting cities. Cavern Coast. It's part of the Parklife DLC. 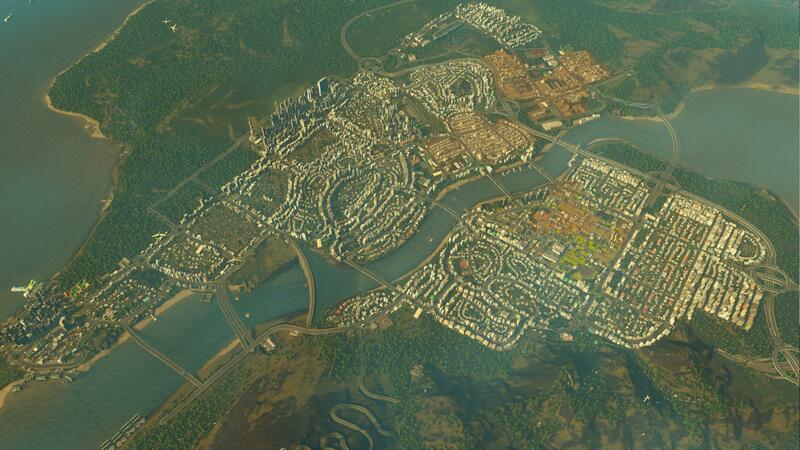 Ugh I keep hitting a population of 10k or so and get bored with the boring grids I do. When I got bored with grids I started to do weird angled and curved roads, I found that as my cities grew the felt like the would have more character. I worried less about filling space efficiently and more about just making it look neat and sophisticated or sometimes just creepy and rundown. If I wanted a slum I built train tracks and nonsensical roads with dead ends. If I wanted downtown's that looked like hey had life to them I'll build triangle style roads and fill them up with high density mix or residential and commercial then leave some space for the unique buildings that you get along the way. I discovered I started enjoying the game more when I gave up the notion that "largest population wins" and I started focusing on making authentic neighborhoods.. Try some of the user-created maps in the workshop as well. A varied terrain can really force you out of the grid. Bought a new laptop, so I thought I'd give it a go after a while. Just a little you know, to appreciate the new hardware. Woo! Got the big DLCs on the sale. Looking forward to getting into this game.